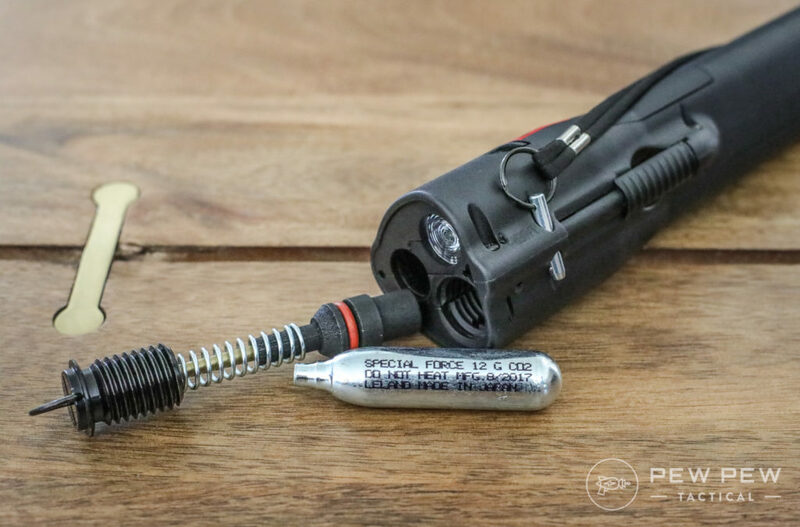 Want a non-lethal option that gives you distance and multiple strike capability? We review this new product (with lots of pics+videos) to see if it’s the right solution for you. 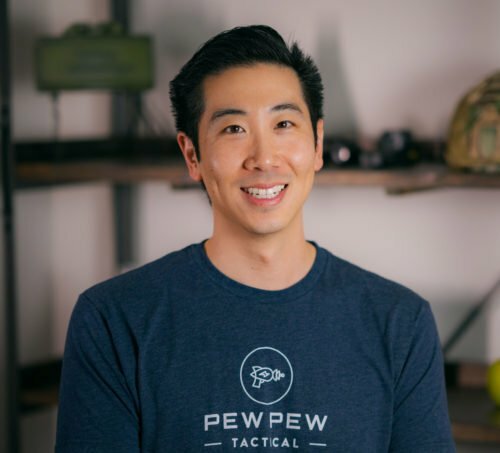 Up until now, PepperBall has focused on military and law enforcement with their more gun-like launchers. PepperBall sent me a unit to test…along with both training and live-pepper projectiles. That was a police handheld model but the projectile is the same. 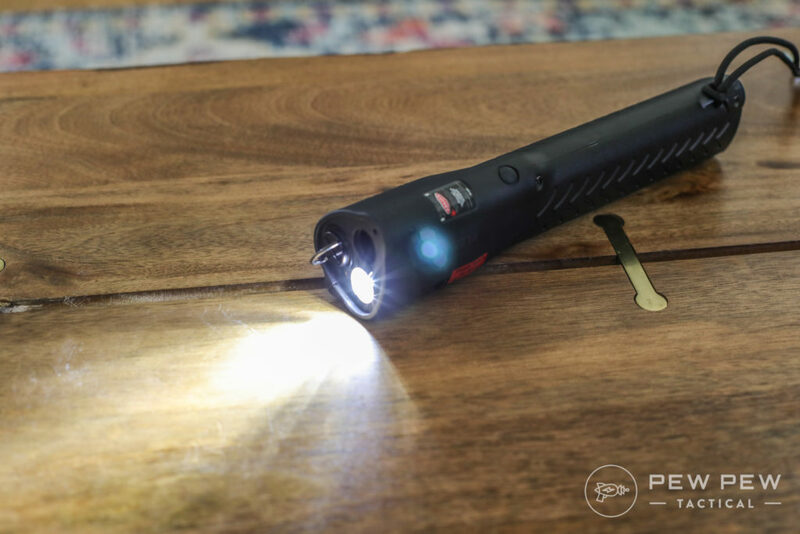 The LifeLite is their new civilian model that looks like a big flashlight so you can hold it while out for a walk or a run. AND it gives you 5 shots of accurate eye-blistering protection. It’s a little large and has some heft (loaded is 1 lb 15 oz). 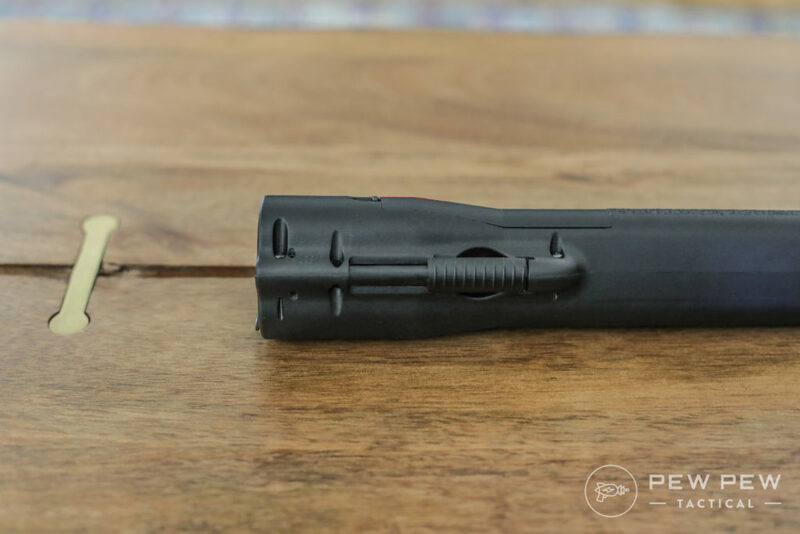 So you’re definitely not concealing it (Picatinny rail adapter)?!? But walking with it and storing it in a purse/bag? Yup! It shoots pretty accurately and harder than a paintball. The button was stiffer than I thought it would be…but still plenty easy to press if you’ve practiced and know what to expect. The test projectiles were filled with baby powder and I could smell it everywhere near the target when I walked over. Would not want it to be aeresolized capsaicin. You load a standard 12 gram CO2 cartridges in the front with a heavy-threaded screw. Then pop in 5 projectiles through the back. Purple = test rounds. There’s an internal battery that can be regular or rechargeable. It takes care of the flashlight and laser. Flashlight is activated by a push-button so it’s usable when you’re out walking. While the laser only comes on when you slide open the “trigger” button. 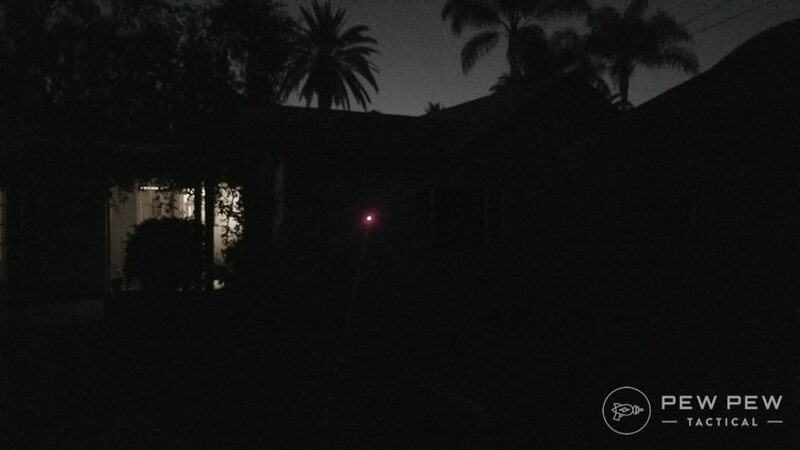 I’ll have some night-use video down below but here’s the laser…good strength for low-light use. Here’s the extended diagram of all the stuff. 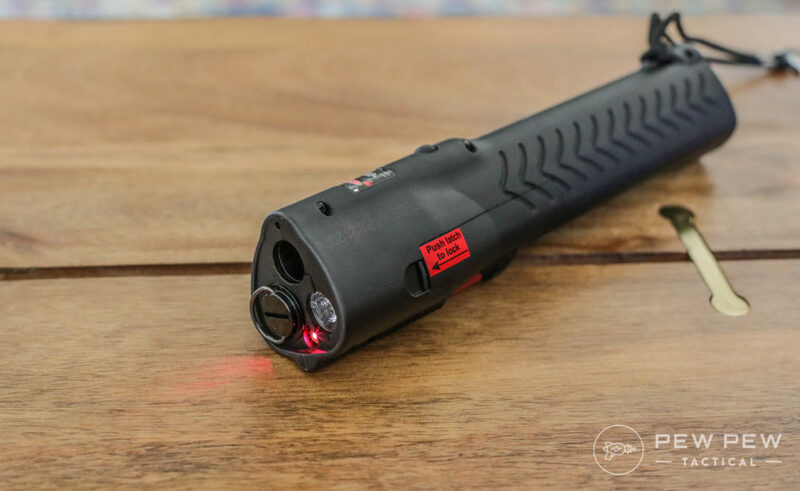 One good thing about the LifeLite is that you don’t have to be as close as other non-lethal options. I tested this by going pretty far away from my targets. I couldn’t see the laser so it was all point shooting. After I saw where the first two shots impacted…it was pretty easy to get on target for the last three shots. 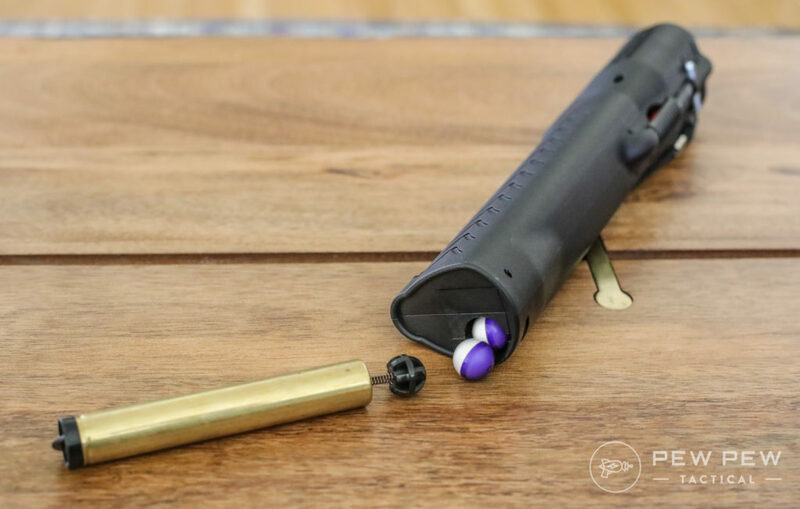 You’re not likely going to be reloading…but the cartridge fires 10 or so more CO2 bursts after the 5 projectiles. You also have to flick the used cartridge out with some force. Bashing the LifeLite does not work…but I found out it’s pretty robust! 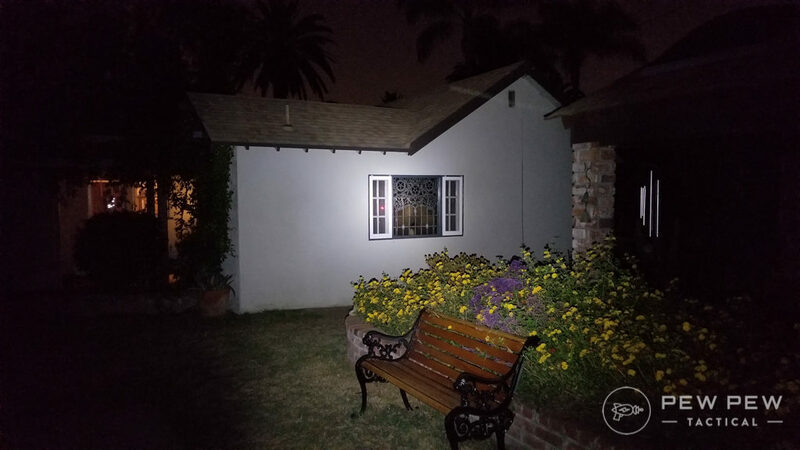 Most bad things happen at night…so how does the LifeLite perform? The flashlight is the perfect brightness. If the name of the game is to blend in…you don’t need 1000 lumens as a walking flashlight. 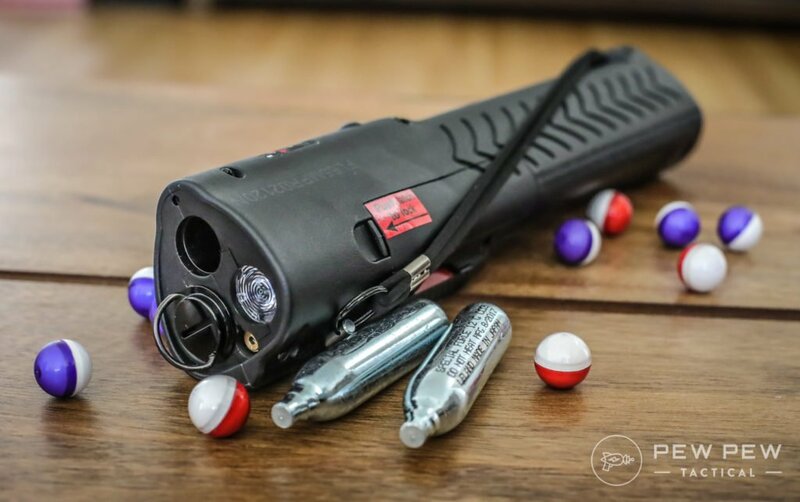 But if you’re going that route…check out our Best EDC Flashlights article. 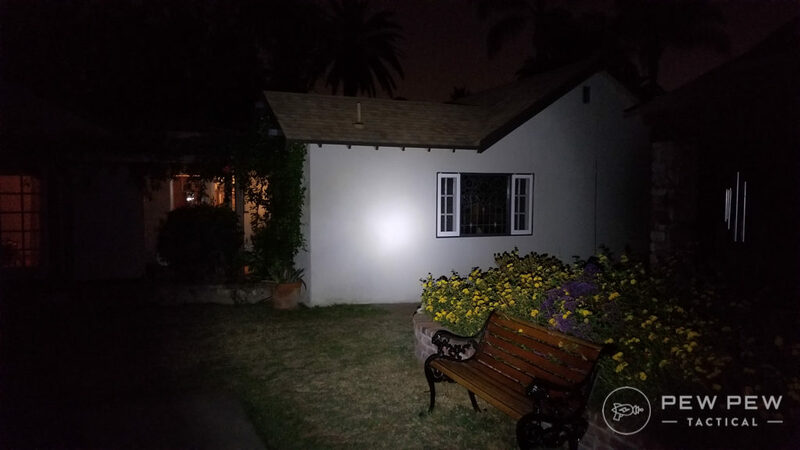 The laser is also great at night. You can see it against the glass here. And with only the laser on (no flashlight button press, only sliding the “safety” latch). Here’s us testing in the dark. We also learned the hard way what happens if you’re downwind. I shot 20 rounds of the stuff which meant 4 CO2 changes. It’s always gone bang. As long as you practice with it beforehand and know how much strength to press the red button…you should be good. Headshots all day with the laser…but easy to walk-in the projectiles too if it’s daytime. It’s pretty big and a little heavy. If you’re walking with it I would almost consider it a workout weight. And if you miss all 5 shots…it could become a blunt force weapon too. Looks like a big flashlight from far away. But the Lifelite name and size made a couple of my buddies ask if I said “Fleshlight.” No comment. Not cheap at the pre-order price of $299. But, you get a flashlight for walking and a workout weight. PLUS the ability to protect yourself with distance and multiple shots. 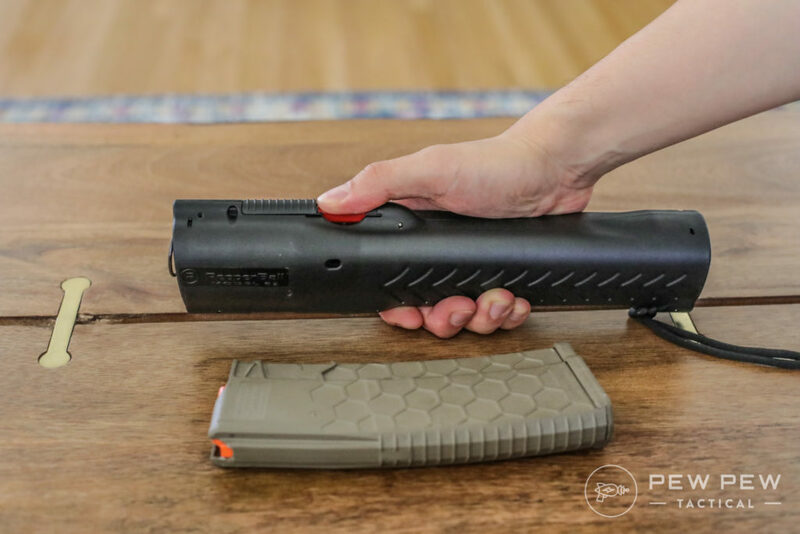 If you’re going non-lethal…the LifeLite is a pretty good option. Accurate, multi-shot, and great aerosolization. Keep in mind the possible negatives…it’s heavy, sized like a large Maglight, not cheap, and with possible back-splash if you’re downwind. Still…a good entry of PepperBall into the civilian market. My wife’s going to continue to test while on her walks. What do you think…are you going to stick with guns only? 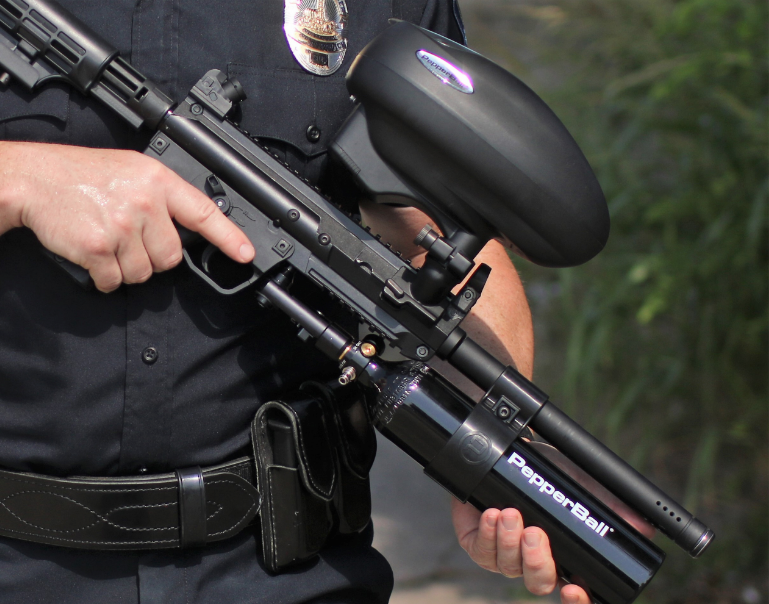 Or how does it compare to other current non-lethal options? 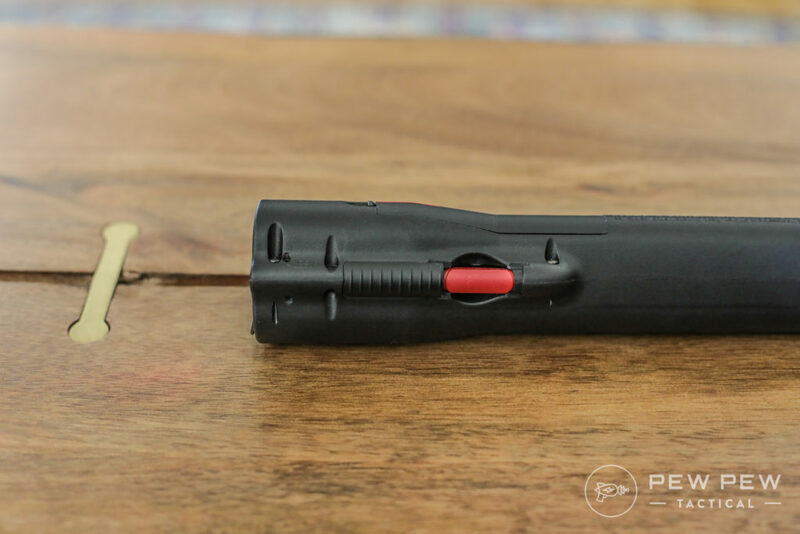 If you hold the LifeLite barrel down and press the trigger the spent CO2 will fall out.